DECO Boat Lifts is proud to be one of the world’s leading manufacturers of high-performance boat lift systems, offering a broad array of products made with impeccable craftsmanship from durable materials. We manufacture three standard lines of boat lifts – the entry-level Maxi, signature DECO and top-of-the-line Concept CRS – which allow us to offer products to suit the budget and specific needs of virtually any boater. 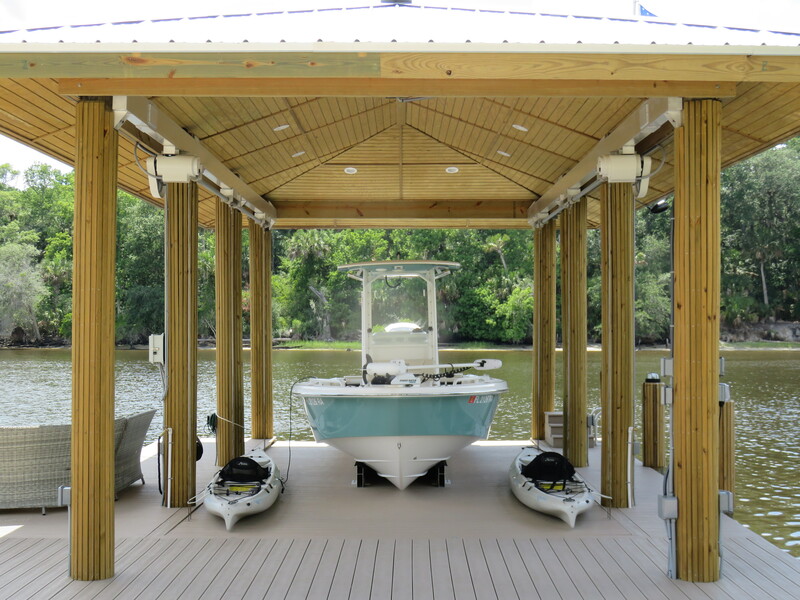 These product lines include lifts in elevator, beamless, traditional four- eight piling beam, and box-beam configurations, so you can count on finding an option that’s well suited to your dock space and your watercraft. Since we began manufacturing boat lifts in 1959, we’ve developed a number of proprietary technologies that allow our boat hoists to outperform those of our competitors. One such innovation is our proprietary gearbox system, in which the bronze worm gear and other components are sealed in our unique blend of lubricants. This design is self-locking for the ultimate in boat lift safety and will keep your boat hoist whisper quiet for early morning launches and late night docking. We have also developed a patented Cable Retention System (CRS), which comes standard on all Concept lifts and is offered as an option on other models. A high-density plastic retainer holds the cables in place even when tension is lost, preventing bird nests and cable overlaps. This leads to a perfect wrap every time and, consequently, longer cable life. At DECO Boat Lifts, not only do we manufacture durable, innovative boat lift systems, but we’re also the perfect source for highly customized boat hoist solutions. We proudly offer specialized boat house lift systems, which can be fitted either with one of our hip- or gable-style aluminum roofs. An existing boat house can be outfitted with a lift using our side-mount brackets or roof tabs. We can also build custom boat lift systems for specialty watercraft, such as catamarans, PWCs, and pontoon boats, and we can manufacture lifts with specialized designs, such as deck lifts, cantilever lifts, and shared piling marina lifts. You can rest assured that no matter what the conditions are at your dock or what type of vessel you own, DECO has a lift system that perfectly suits your needs. DECO Boat Lifts also provides ongoing support to both our dealers and consumers to ensure that our boat lifts are always installed properly and deliver years of reliable service. We offer factory training so our dealers can receive extensive hands-on instruction on how to properly handle and install our products. 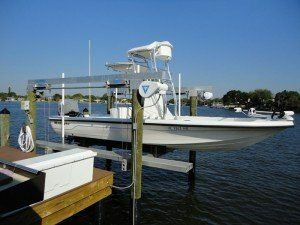 We also provide a five-year warranty on every elevator and PWC boat hoist we sell and a 10-year warranty on every aluminum boat lift, to give you added protection for your investment. DECO Boat Lifts has even earned an A+ rating from the Better Business Bureau for our outstanding customer service. To learn more about our boat lift solutions for residential or commercial docks, contact DECO Boat Lifts today. We proudly serve Miami, FL; Jacksonville, FL; Bradenton, FL; Sarasota, FL; New Orleans, LA; Houston, TX; and other ports across the Southeast. I have been installing boat lifts for over 20 years and DECO is by far the best boat lift manufacturing company in the country. Their staff is friendly, they stand behind their product, and they find a solution when other lift companies can’t. I highly recommend you contact DECO for all of your boat lift needs. The ramps you built for the Nathan Benderson Park float docks are installed and look terrific! There should be more raves about them at the regatta this weekend. We appreciate the time and effort it took to build such a fine product, it took the concerted effort of everyone involved. Your attention to detail is nothing short of amazing. Hello Mike, The 16,000 lbs elevator lift that I bought from you worked out really well. We found it to be well constructed, heavy duty and a nice project for us to install. Just what we were looking for. Thank you. Kind regards, a happy customer.